Whitney said, “Worship is focusing on and responding to God.”I agree with him but think that I would state it in a different way. My favorite text of scripture is Exodus chapter 34 because the Lord has used this passage to help me understand all of scripture, especially the incarnation of his Word in Jesus Christ. Therefore, worship is a response to seeing the glory of God, and or hearing about God. I read from both the Old Testament and the New Testament every morning which causes me to respond in the worship of God: Father and Son (Jesus Christ) and Holy Spirit. This is followed by a prayer of confession, thanksgiving and supplication. In order to improve in this discipline, I must persevere in it and I can only do that by the will of the Father in Jesus Christ guided by his Spirit. Many people call the singing of songs at the beginning of the church service worship. I find this curious, because we go from a time of chatting with one another to songs called worship. 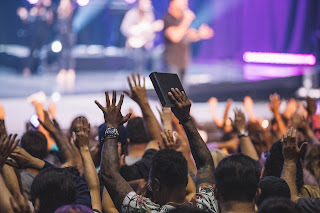 It seems to me since worship is a response to seeing the glory of God and or hearing about God from his inspired Word, shouldn’t the service begin with the reading and exposition of Scripture and not the other way around? Donald S. Whitney, Spiritual Disciplines for the Christian Life,2nded. (Colorado Springs: NavPress, 2014), 103.